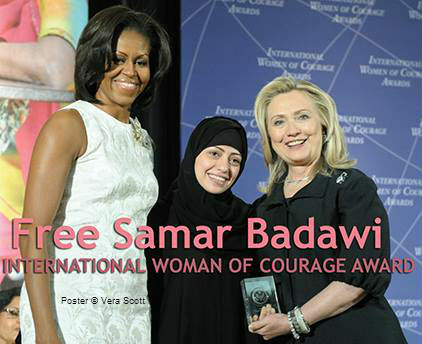 Earlier today, Saudi Arabian human rights activist Samar Badawi was questioned by authorities with that nation’s Bureau of Investigation and was allowed to leave after the interview. Today's investigation is related to previous issues about my HR and civil activities including women's campaign against male guardians. Samar Badawi is the sister of Raif Badawi, the human rights writer who was convicted of apostasy and other charges and sentenced to ten years in prison and 1000 lashes with a cane, and she is the wife of Waleed Abulkhair, who is Raif Badawi’s lawyer as well as his brother-in-law. Waleed is in prison for his human rights advocacy as well. Because the Bureau of Investigations gave no reason for the summons to Samar, she could not prepare for the questioning. This is a common form of judicial harassment in nations that use a judiciary as a tool to intimidate. So, it was more harassment only.. I’m glad she was allowed to leave, at least. Me, too. She hasn’t replied to people’s online questions … probably for the best.